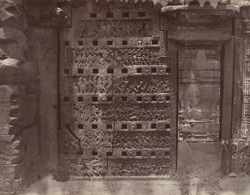 Photograph taken by William Henry Pigou in c. 1856, of a temple window at Narsapur, now in Andhra Pradesh. This perforated stone temple window is divided into horizontal bands of bas-reliefs separated by long narrow openings which allow light into the interior of the temple. Small medallions contain little figures of men and animals. The scenes represented in the reliefs are from the epics of the Ramayana and the Mahabharata. Ravana with his 100 arms is visible on the second line. Narsapur, on the banks of the Vasishtha, a tributary of the river Godavari, was once a Dutch port in the colonial era. Much before that, it was part of the territory of the Chalukyas, a dynasty which ruled parts of the Deccan between the 6th to 8th century, and again flourished between the 10th and 12th century. They were innovative temple builders and left a rich legacy of Hindu and Jain temples, which was added to by dynasties like the Rashtrakutas and the Hoysalas who took over Chalukyan territories when they declined.